Osteoarthritis of the knee results from a breakdown of the articular cartilage. The breakdown of articular cartilage leaves debris floating inside the knee. This break down also leads to the release of factors that promote inflammation. Arthroscopic knee surgery (arthroscopy) is performed to “wash out” the joint, remove the debris, dilute the inflammatory factors and trim up any loose, damaged articular cartilage. In advanced cases of osteoarthritis, there may be small pieces of bone or cartilage floating within the joint (loose bodies). Loose bodies may cause the knee to be painful, lock or feel unstable. Arthroscopy may be performed to remove these loose bodies. • mild to moderate changes on x-ray. Arthroscopy improves pain and function, however, the effects may only be temporary. Improvement may last anywhere from several months to a few years. Often this procedure is used as a way to delay total knee replacement surgery. For this reason, it is a good option for young, active individuals who are too young for a total knee replacement. 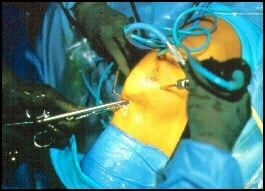 This procedure is performed during arthroscopic knee surgery. The procedure involves penetrating the zone of tissue beneath the damaged articular cartilage. This allows for activation of cells that have the potential to form fibro-cartilage. The newly formed fibro-cartilage differs from the original articular cartilage in that it is weaker and less capable to withstand forces. This procedure, or other similar procedures, is best suited for patients with small, localized articular cartilage defects. The rehabilitation after these types of procedures is more intense than with some of the other surgeries listed in this section however extensive rehabilitation helps to improve success rates.